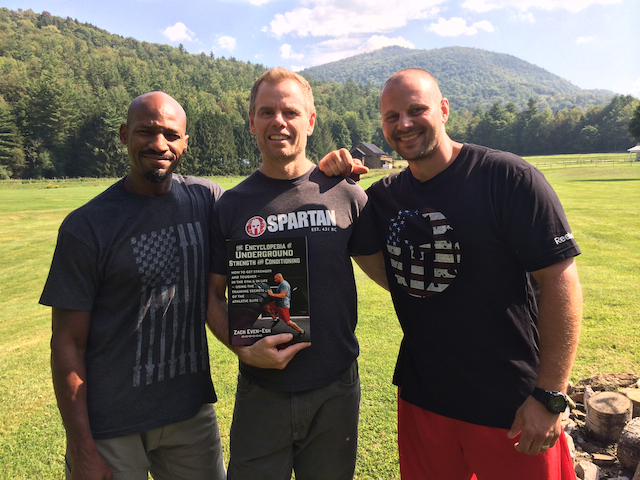 Above, Working w/ Joe DeSena, The Founder of Spartan Race and Quatro Deuce at the Birthplace of Spartan Race, Pittsfield, Vt. I receive messages on the regular from Coaches who want to visit The Underground Strength Gym, take me out to lunch, pick my brain, etc. I have found that when there is no investment, the information is not valued and in turn, you are only motivated for the moment and ultimately no life changing actions are taken. In my experiences of coaching, I have seen businesses and lives change completely from 1 BIG idea. How much can your life, health or business change from 1 BIG idea? How willing are you to follow through on a big idea if it was given to your easily and for free? Probably not much action, that's the unfortunate truth. So when you invest in yourself it shows me that you are serious and ready to follow through. I do various types of consulting from 1 on 1 to small groups or large groups. These can all be tailor made for your needs / your groups needs. * Group Consult / Speak to Your Company - Please E Mail with Your Specific Details and Goals. * Speak at Your Event: If this event is in NJ, the investment is $3K per day. If this event is outside of NJ the investment is $3K per day + All Travel Fees paid for. If I am away from my family / business for 3 days that is $9K + All Travel Fees paid. Payment is to be received no later than 30 days prior to the event.